Piperazinyl quinolones such as ciprofloxacin, ofloxacin and levofloxacin are an important group of quinolone antimicrobials which are widely used in the treatment of various infectious diseases. In the present study, we synthesized a new series of levofloxacin derivatives and evaluated their antibacterial activities. The N-substituted analogs of levofloxacin 6a–j were prepared by nucleophilic reaction of N-desmethyl levofloxacin 11 with thienylethyl bromide derivatives 8 or 9. All target compounds were tested using conventional agar dilution method in comparison to levofloxacin and N-desmethyl levofloxacin and their MIC values were determined against a panel of Gram-positive and Gram-negative bacteria. All compounds showed significant antibacterial activities against Gram-positive bacteria (MIC = 0.04-6.25 μg/mL); however, the activity against Gram-negative bacteria was lower (MIC = 1.56–100 μg/mL). As is evident from the data, oxime derivatives 6e, 6h and 6i are superior in inhibiting the growth of Gram-positive bacteria (MIC = 0.04–0.19 μg/mL), and their activities were found to be 5–25 times better than N-desmethyl levofloxacin 11 and equal or better than levofloxacin 4. Fluoroquinolones which are synthetic antibacterial agents are useful for the treatment of urinary tract infections, soft tissue infections, respiratory infections, typhoid fever, sexually transmitted diseases, bone-joint infections, community-acquired pneumonia, acute bronchitis, and sinusitis. Fluoroquinolones consist of a bicyclic ring structure in which there is a substitution at position N-1; most of the current agents have a carboxyl group at position 3, a keto group at position 4, a fluorine atom at position 6 and a nitrogen heterocyclic moiety at the C-7 position. 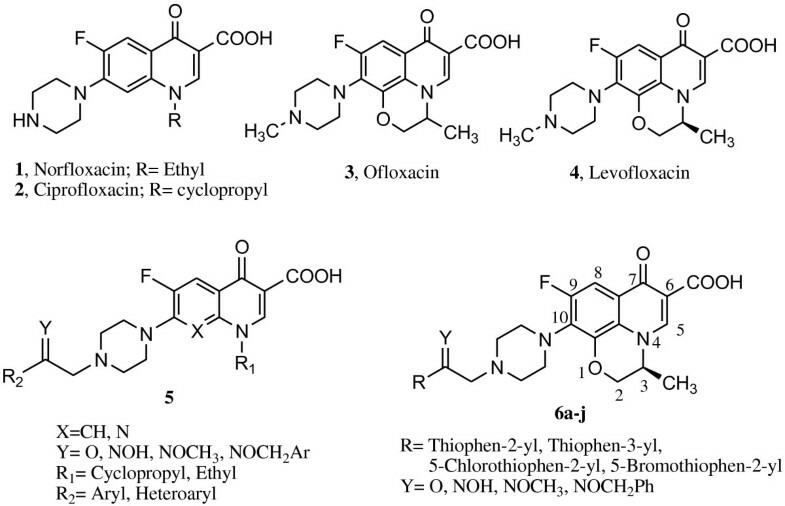 Piperazine substitution at C-7 position has resulted in a wide range of clinically useful fluoroquinolone antibacterial agents namely norfloxacin (1), ciprofloxacin (2), ofloxacin (3) and levofloxacin (4)[3, 4]. Fluoroquinolones with 7-piperazinyl moiety have been reported to possess potent antibacterial activity[5, 6]. Levofloxacin, a chiral version of the earlier drug ofloxacin, is a successful fluoroquinolone antibacterial that departs from the typical quinolones substructure by having a fused ring connecting the N1 to C8 position. This ring is connected with an ether moiety at C8. Levofloxacin has been reported to be active in vitro against both Gram-positive and Gram-negative bacteria. Two major targets have been identified for levofloxacin activity, topoisomerase II (DNA-gyrase) in Gram-negative bacteria and topoisomerase IV in Gram-positive bacteria. According to the inhibition mechanisms of the quinolones, the site near the C-7 substituent is regarded as drug-enzyme interaction domain and controls the spectrum and selectivity of quinolone molecule. Over the past few years, we were particularly interested in the synthesis and evaluation of N-substituted 7-piperazinyl quinolones for their antibacterial activities[11–16]. Although the nature of the C-7 substituent was known to influence quinolone activity in bacteria, we identified that addition of a certain bulky group as a particular chemical modification is permitted at the C-7 position of the piperazine ring and allows manipulation of selectivity and potency. 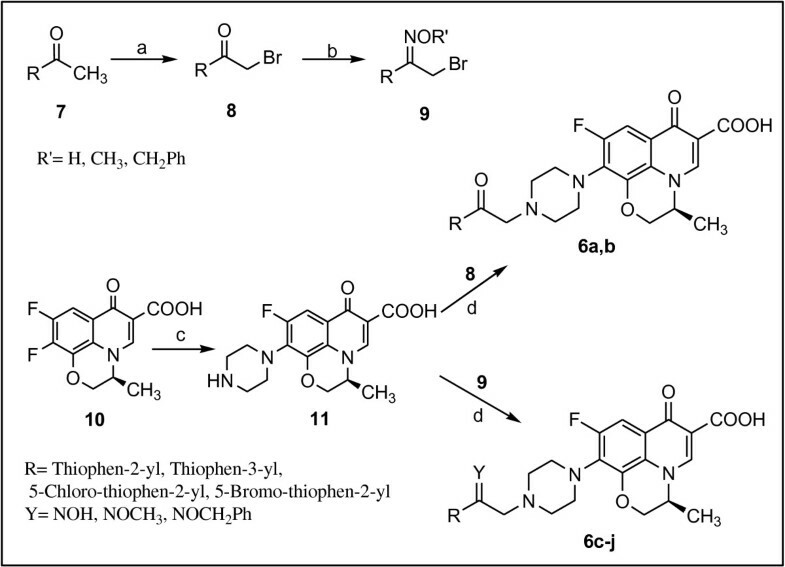 Previously, we described the synthesis and antibacterial activity of certain piperazinyl quinolones (Figure1), with 2-(thiophen-3-yl)-2-oxoethyl or 2-(thiophen-3-yl)-2-oxyiminoethyl moieties attached to the piperazine ring at the C-7 position. In the present study, we have aimed to achieve new quinolone antibacterial, by preparing the levofloxacin derivatives 6a–j carrying a 2-thienyl-2-oxoethyl or a 2-thienyl-2-oxyiminoethyl moiety attached to the piperazine ring at C-10 position (Figure1). The structures of some known fluoroquinolones (1-5) and the synthesized compounds 6a-j. Chemicals and all solvents used in this study were purchased from Merck AG and Aldrich Chemical. Melting points were determined on a Kofler hot stage apparatus and are uncorrected. The IR spectra were obtained on a Shimadzu 470 spectrophotometer (potassium bromide disks). 1H-NMR spectra were measured using a Bruker 400 spectrometer, and chemical shifts are expressed as δ (ppm) with tetramethylsilane as internal standard. Merck silica gel 60 F254 plates were used for analytical TLC. Yields are of purified product and were not optimized. The intermediate compounds 9 were prepared according to the literature[12, 14]. N-Desmethyl levofloxacin was prepared as previously described method. The synthetic route for achieving the target compounds 6a–j was depicted in Figure2. Synthesis of levofloxacin derivatives 6a–j. Reagents and conditions :(a) CuBr2, CHCl3–EtOAc, reflux;(b) HONH2·HCl orMeONH2·HCl or BnONH2·HCl, MeOH, r.t.; (c) piperazine; (d) DMF, NaHCO3, r.t.
A mixture of thienylethyl bromide derivatives 8 or 9 (0.55 mmol), N-desmethyl levofloxacin 11 (174 mg, 0.5 mmol) and NaHCO3 (42 mg, 0.5 mmol) in DMF (5 mL) was stirred at room temperature for 6–10 h. After consumption of N-desmethyl levofloxacin 11 (monitored by TLC), water (20 mL) was added and the precipitate was filtered, washed with water and crystallized from methanol-chloroform (9:1) to give compound 6a–j. Yield: 31%; mp 165–166°C; IR (KBr) cm−1: 1622, 1721 (C = O). 1H-NMR (DMSO-d6): 1.45 (d, 3H, CH3, J = 6.0 Hz), 3.26–3.33 (m, 4H, piperazine), 3.38–3.42 (m, 4H, piperazine), 3.49 (s, 2H, CH2), 3.75 (s, 1H, CH2), 4.39 (d, 1H, CH2, J = 10.9 Hz), 4.60 (d, 1H, CH2, J = 10.9 Hz), 4.87 (m, 1H, CH-Me), 7.53 (d, 1H, thiophene, J = 5.0 Hz), 7.58–7.65 (m, 1H, thiophene), 7.81 (d, 1H, H8, J = 11.9 Hz), 8.99 (s, 1H, H5), 15.17 (s, 1H, COOH). Yield: 26%; mp 156–157°C; IR (KBr) cm−1: 1620, 1719 (C = O). 1H-NMR (DMSO-d6): 1.43 (d, 3H, CH3, J = 6.2 Hz), 3.27–3.34 (m, 4H, piperazine), 3.36–3.41 (m, 4H, piperazine), 3.47 (s, 2H, CH2), 3.77 (s, 1H, CH2), 4.40 (d, 1H, CH2, J = 11.0 Hz), 4.59 (d, 1H, CH2, J = 11.0 Hz), 4.85 (m, 1H, CH-Me), 7.52 (d, 1H, thiophene, J = 5.0 Hz), 7.56–7.64 (m, 1H, thiophene), 7.79 (d, 1H, H8, J = 12.1 Hz), 8.98 (s, 1H, H5), 15.21 (s, 1H, COOH). Yield: 24%; mp 180–181°C; IR (KBr) cm−1: 1626, 1717 (C = O). 1H-NMR (DMSO-d6): 1.62 (d, 3H, CH3, J = 5.3 Hz), 2.47–2.70 (m, 4H, piperazine), 3.34–3.42 (m, 4H, piperazine), 3.51 and 3.96 (two s, 2H, CH2, E- and Z-isomers), 4.04 and 4.07 (two s, 3H, OMe, E- and Z-isomers), 4.31–4.37 (m, 1H, CH2), 4.42–4.52 (m, 1H, CH2), 4.47–4.51 (m, 1H, CH-Me), 7.04 and 7.08 (two d, 1H, thiophene, E- and Z-isomers, J = 4.0 Hz), 7.63 and 7.69 (two d, 1H, thiophene, E- and Z-isomers, J = 4.0 Hz), 7.73 (d, 1H, H8, J = 12.3 Hz), 8.61 (s, 1H, H5), 15.01 (s, 1H, COOH). Yield: 15%; mp 143–144°C; IR (KBr) cm−1: 1H-NMR (DMSO-d6): 1.62 (d, 3H, CH3, J = 6.6 Hz), 2.47–2.72 (m, 4H, piperazine), 3.28–3.43 (m, 4H, piperazine), 3.50 and 3.65 (two s, 2H, CH2, E- and Z-isomers), 4.34 (d, 1H, CH2, J = 6.6 Hz), 4.47 (d, 1H, CH2, J = 6.6 Hz), 5.19 and 5.26 (two s, 2H, OCH2, E- and Z-isomers), 5.32 (s, 1H, CH-Me), 6.82 and 6.84 (two d, 1H, thiophene, E- and Z-isomers, J = 4.0 Hz), 6.91 and 6.94 (two d, 1H, thiophene, E- and Z-isomers, J = 4.0 Hz), 7.36–7.40 (m, 5H, phenyl), 7.74 (d, 1H, H8, J = 10.0 Hz), 8.61(s, 1H, H5), 15.00 (s, 1H, COOH). Yield: 16%; mp 314–315°C; IR (KBr) cm−1: 1623 (C = O). 1H-NMR (DMSO-d6): 1.40–1.58 (m, 3H, CH3), 2.45-78 (m, 4H, piperazine), 2.85–3.00 (m, 4H, piperazine), 3.51 (s, 2H, CH2), 4.35 (d, 1H, CH2, J = 10.4 Hz), 4.57 (d, 1H, CH2, J = 10.4 Hz), 4.58–4.49 (m, 1H, CH-Me), 7.20–7.40 (m, 1H, thiophene), 7.56 (d, 1H, H8, J = 11.6 Hz), 7.66–7.76 (m, 1H, thiophene), 7.82–7.90 (m, 1H, thiophene), 8.96 (s, 1H, H5), 11.95 (s, 1H, NOH), 15.20 (s, 1H, COOH). Yield: 19%; mp 224–225°C; IR (KBr) cm−1: 1719 (C = O). 1H-NMR (DMSO-d6): 1.43 (d, 3H, CH3, J = 4.3 Hz), 2.53–2.63 (m, 4H, piperazine), 3.23–3.31(m, 4H, piperazine), 3.50 and 3.66 (two s, 2H, CH2, E- and Z-isomers), 3.89 (s, 3H, OCH3), 4.36 (d, 1H, CH2, J = 8.8 Hz), 4.57 (d, 1H, CH2, J = 8.8 Hz), 4.90–4.94 (m, 1H, CH-Me), 7.08–7.23 (m, 1H, thiophene), 7.54 and 7.76 (two d, 1H, thiophene, E- and Z-isomers, J = 4.2 Hz), 7.79 and 7.83 (two d, 1H, thiophene, E- and Z-isomers, J = 4.2 Hz), 7.91 (d, 1H, H8, J = 10.0 Hz), 8.96 (s, 1H, H5), 15.00 (s, 1H, COOH). Yield: 17%; mp 157–158°C; IR (KBr) cm−1: 1720 (C = O). 1H-NMR (DMSO-d6): 1.44(d, 3H, CH3, J = 7.5 Hz), 2.53–2.61 (m, 4H, piperazine), 3.23–3.38 (m, 4H, piperazine), 3.50 and 3.69 (two s, 2H, CH2, E- and Z-isomers), 4.65–4.80 (m, 1H, CH2), 4.90–4.97 (m, 1H, CH-Me), 5.17 and 5.28 (two s, 2H, OCH2, E- and Z-isomers), 7.06–7.22(m, 1H, thiophene), 7.30–7.42 (m, 5H, phenyl), 7.52 and 7.59 (d, 1H, thiophene, J = 4.4 Hz, Z-isomer), 7.77 and 7.89 (two d, 1H, thiophene, E- and Z-isomers, J = 4.4 Hz), 7.94 (d, 1H, H8, J = 10.0 Hz), 8.96 (s, 1H, H5), 15.01 (s, 1H, COOH). Yield: 22%; mp 354–356°C; IR (KBr) cm−1: 1631, 1719 (C = O). 1H-NMR (DMSO-d6): 1.40–1.48 (m, 3H, CH3), 2.53–2.60 (m, 4H, piperazine), 3.37–3.43 (m, 4H, piperazine), 4.31–4.38 (m, 1H, CH2), 4.52–4.60 (m, 1H, CH2), 4.84–4.92 (m, 1H, CH-Me), 7.50–7.60 (m, 2H, thiophene), 7.72 (d, 1H, thiophene, J = 4.5 Hz), 8.38–8.43 (m, 1H, H8), 8.94 (s, 1H, H5), 11.37 (s, 1H, NOH), 15.19 (s, 1H, COOH). Yield: 18%; mp 156–157°C; IR (KBr) cm−1: 1630, 1721 (C = O). 1H-NMR (DMSO-d6): 1.42 (d, 3H, CH3, J = 4.8 Hz), 2.51–2.65 (m, 4H, piperazine), 3.24–3.32 (m, 4H, piperazine), 3.52 (s, 2H, CH2), 3.91 (s, 3H, OCH3), 4.37 (d, 1H, CH2, J = 8.7 Hz), 4.59 (d, 1H, CH2, J = 8.7 Hz), 4.91–4.95 (m, 1H, CH-Me), 7.07–7.13 (m, 1H, thiophene), 7.54 (d, 1H, thiophene, J = 4.0 Hz), 7.85 (d, 1H, thiophene, J = 4.0 Hz), 7.90 (d, 1H, H8, J = 10.3 Hz), 8.98 (s, 1H, H5), 15.20 (s, 1H, COOH). Yield: 17%; mp 162–163°C; IR (KBr) cm−1: 1621, 1716 (C = O). 1H-NMR (DMSO-d6): 1.43 (d, 3H, CH3, J = 6.8 Hz), 2.40–2.67 (m, 4H, piperazine), 3.17–3.44 (m, 4H, piperazine), 3.54 and 3.65 (two s, 2H, CH2, E- and Z-isomers), 4.54–4.58 (m, 1H, CH2), 4.90–4.93 (m, 1H, CH-Me), 5.14 and 5.28 (two s, 2H, OCH2, E- and Z-isomers), 7.06–7.20 (m, 1H, thiophene), 7.39 (d, 1H, thiophene, J = 4.0 Hz, Z-isomer), 7.44 (d, 1H, thiophene, J = 4.0 Hz, Z-isomer), 7.48–7.68 (m, 5H, phenyl), 7.68 (d, 1H, thiophene, J = 4.0 Hz, E-isomer), 8.31 (d, 1H, thiophene, J = 4.0 Hz, Z- isomer), 8.38 (d, 1H, thiophene, J = 4.4 Hz, E-isomer), 8.01 (s, 1H, H8), 8.96 (s, 1H, H5), 15.01 (s, 1H, COOH). Compounds 6a–j were screened for their antibacterial activity against Gram-positive (Staphylococcus aureus ATCC 6538, Staphylococcus epidermidis ATCC 12228, Bacillus subtilis ATCC 6633) and Gram-negative (E. coli ATCC 8739, Pseudomonas aeruginosa ATCC 9027, Klebsiella pneumoniae ATCC 10031) bacteria by the conventional agar dilution method. Two-fold serial dilutions of the compounds and reference drugs (levofloxacin and N-desmethyl levofloxacin) were prepared in Mueller-Hinton agar. Drugs (10.0 mg) were dissolved in DMSO (1 mL) and the solution was diluted with water (9 mL). Further progressive double dilution with melted Mueller-Hinton agar was performed to obtain the required concentrations of 100, 50, 25, 12.5, 6.25, 3.12, 1.56, 0.78, 0.39, 0.19, 0.09, 0.04, 0.02 and 0.01 μg/mL. Petri-dishes were inoculated with 1–5 × 104 colony-forming units (cfu) and incubated at 37°C for 18 h. The minimum inhibitory concentration (MIC) was defined as the lowest concentration of the test compound, which resulted in no visible growth on the plate. To insure that the solvent had no effect on bacterial growth, a control test was performed with test medium supplemented with DMSO at the same dilutions as used in the experiment. As summarized in Figure2, the N-substituted analogs of levofloxacin 6a–j were prepared by nucleophilic reaction of N-desmethyl levofloxacin 11 with thienylethyl bromide derivatives 8 or 9 employing reaction sequences previously described by us for the preparation of other N-substituted piperazinyl quinolones. Thus, the oxime derivatives 9 were synthesized by the reaction of ketone 8 with hydroxylamine hydrochloride or O-methylhydroxylamine hydrochloride or O-benzylhydroxylamine hydrochloride[12, 14]. On the other hand, the piperazinyl quinolone (11, N-desmethyl levofloxacin) was prepared according to the known method, by the reaction of piperazine with 9,10-difluoro-2,3-dihydro-3-methyl-7-oxo-7H-pyrido[1,2,3-de][1,4]benzoxazine-6-carboxylic acid 10. Reaction of N-desmethyl levofloxacin 11 with thienyl ethyl bromide derivatives 8 or 9 in DMF, in the presence of NaHCO3 at room temperature afforded corresponding ketones 6a,b and oxime derivatives 6c–j, respectively. The minimum inhibitory concentrations (MICs, μg/mL) obtained for compounds 6a–j are presented in Table1. In general, Table1 reveals that higher susceptibilities were observed with Gram-positive and poorer susceptibilities with Gram-negative bacteria. The MIC values of ketones 6a,b and oximes 6c–j against Gram-positive strains indicate that most compounds possessed a comparable or better activity (MIC = 0.04–3.12 μg/mL) with respect to N-desmethyl levofloxacin 11 and levofloxacin 4 (MIC = 0.25–4 μg/mL). As is evident from the data, oximes 6e, 6h and 6i followed by ketone 6a are superior in inhibiting the growth of Gram-positives (MIC = 0.04–0.19 μg/mL), and their activities were found to be 5–25 times better than N-desmethyl levofloxacin 11 and equal or better than levofloxacin 4. In general, most compounds showed weak to good activity (MIC = 1.56–100 μg/mL) against Gram-negative bacteria. Compound 6b was the most potent against E. coli, Pseudomonas aeruginosa and Klebsiella pneumonia (MIC = 1.56–6.25 μg/mL). Comparison between MIC values of 2-thienyl drivatives 6e–g and 3-thienyl compounds 6h–j revealed that the corresponding regioisomers have a same antibacterial activity and this modification cannot improve the activity. Also, etherification of oximes by methyl or benzyl groups dramatically diminished the activity against Gram-negatives. However, by O-methylation, the activity against Gram-positive bacteria was maintained. In addition, by comparison of 5-chlorothiophene derivatives 6c,d and corresponding unsubstituted analogs 6f,g it could be concluded that halogen substituent is not important for activity. This work was supported by grants from Research Council of Tehran University of Medical Sciences and Iran National Science Foundation (INSF). NM: Synthesis of some target compounds (15%). ZA: Synthesis of the intermediates and some target compounds (10%). EA: Collaboration in identifying of the structures of target compounds (10%). SE: Collaboration in design and identifying of the structures of target compounds, manuscript preparation (10%). MAF: Evaluation of the antibacterial activities (10%). NS: Evaluation of the antibacterial activities (10%). NK: Evaluation of the antibacterial activities (5%). AS: Collaboration in identifying of the structures of target compounds (10%). AF: Design of target compounds and management of the synthetic and pharmacological parts (20%). All authors read and approved the final manuscript.